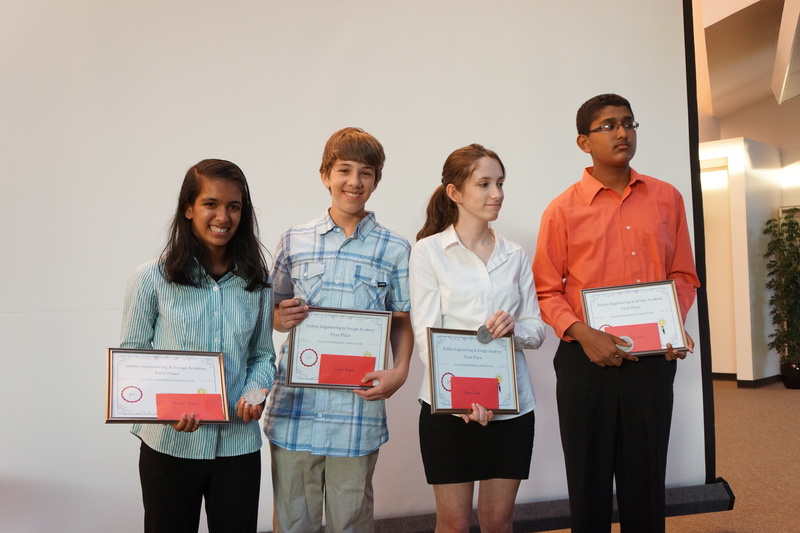 Dublin High School’s Engineering and Design Academy closed out the 2012-13 school year with an evening of engineering creativity, invention and a Shark Tank-style competition. Prior to the evening of competition, teams of students from Ms. Chou and Mr. Uken’s Introduction to Engineering Design and Principles of Engineering classes had two weeks to create and develop their own ideas for products that they could sell in today’s marketplace. Ms. Chou hopes to make this an annual event. Eight teams made it to the final round where a panel of judges from Lawrence Berkeley National Laboratory, Chevron, IBM, Support.com and Dublin San Ramon Services District followed a strict rubric to score and judge the presentations. Each team had 5 minutes to present and 2 minutes to answer questions. Prizes included a posted signed by MythBusters Adam Savage and Kari Byron from the Dublin High School Engineering Academy Open House Starring MythBusters and a one-of-a-kind set of coins created for the event by a 3D metal printer. In addition to the live presentations, student teams also competed for the best display in the showcase competition.